I think my girls call the owner of Whimsy Ranch behind my back and tell her what they want to wear. I could literally buy one of everything in her shop and make my girl's frilly sparkle princess dreams come true! 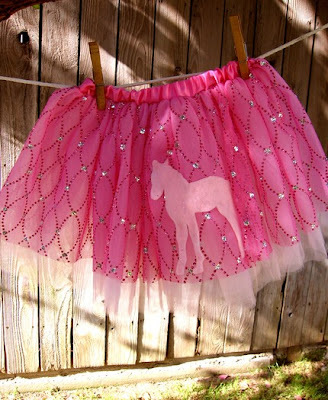 How cute would this tutu have been at mini horse day. Every time I have money in my Paypal account I am determined to spend it all here. Today was the day... until I had to buy a lame hubcap for my van on Ebay. It went "missing" (or I hit a curb and it fell off... hard to say) and it looks like I am driving around with a spare. Hubcap or tutu? Which sounds more fun? Oh my gosh, Julie! I LOVE, love, love your blog! And this tutu - my daughter would give her teeth to have this. Adorable. Why does everything I like have to cost money? Why can't we all be like kids and just play with junky stuff laying around?